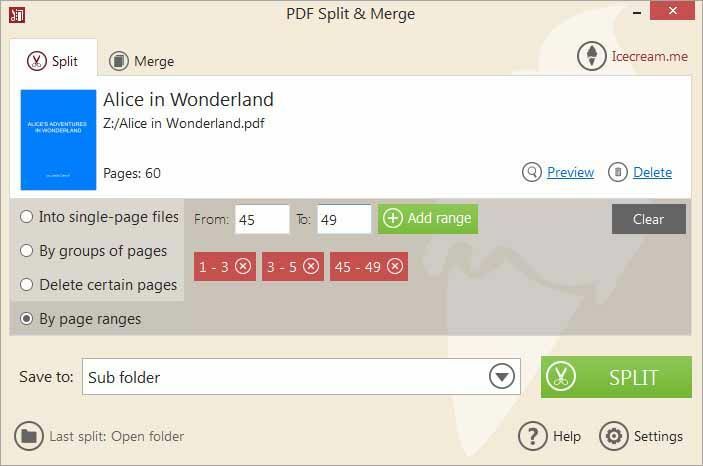 Download PDF Split&Merge latest version free. After PDF converter by IceCream Apps this is another utility for dealing with PDF files. PDF converter by IceCream Apps only offers you to convert different documents into PDF file format but the IceCream PDF Split & Merge allows you to make partitions of a single document or to add up many of the documents in single file. It depend upon you what It depend upon you what you need just do it. As other applications by IceCreams apps are free this program is not free for the users. You can have just a demo version from here. If you are having a large PDF file which consists of lots of pages, simply you can make separation between different portions easily. For example if you are having and Ebook in PDF format you and want to split that book into many portion, you can do it easily. You can simple split them according to the chapters. Moreover, the program allows you to split all the pages according to same specific interval or you can apply customized options. You can also delete some particular pages from the document instead of splitting them all. While using splitter feature you can have a complete look upon the whole document page by page. You can have that preview as like you are using any PDF reader. This the thing which IceCream PDF Converter also allows you. Similarly now if we talk about the joiner option, you can also join different documents of some of pages of that documents into your input file. This is so much easy even more than you expect. After putting the command the program automatically detect the input file location and saves output file in a subfolder there. The program creates that subfolder automatically without harming your already existing file there. You even don’t need to give any name of the file again and again. Just set that customize name once and then enjoy the facilitation. And after all that you want to put the different names of each file you can do it as well.